During Labor Day weekend – one of the year’s busiest weekends for moving, I’ve heard – my hunt for urban couches came up empty. I guess people in the Green Lake neighborhood are just a bit behind schedule, because a week later, I spotted this one right next to a bus stop. 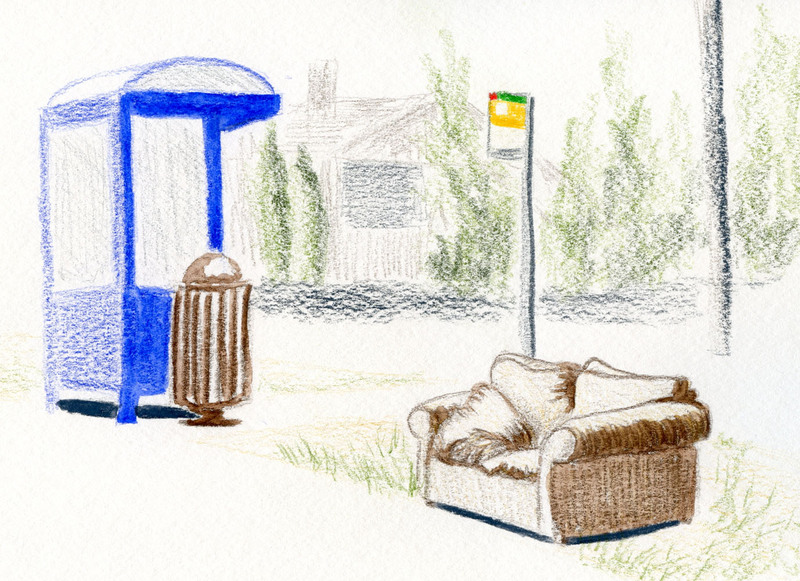 A comfy place to wait if you miss your bus, right? Paper note: Ahhh. . . it feels so good to be sketching on thick, toothy Canson XL 140-pound paper again! With watercolor pencils, I love everything about it. As long as I’m using color, it’s going to have to stay in my bag. Great couch! Love seeing the color too!